The following presentations were made at national conferences. Click on the cover illustrations below to see recent abstracts or papers. A listing of additional national conferences follows the more recent ones. Enrollment: Addressing Trends. Invited panelist. IDEC Village Square Critical Issues Session, Annual IDEC Conference. Baltimore, MD. Mar 2012. Major Crossing: CAD for Artists. T.L. Houser and M. Oliveri. Presentation with published abstract. 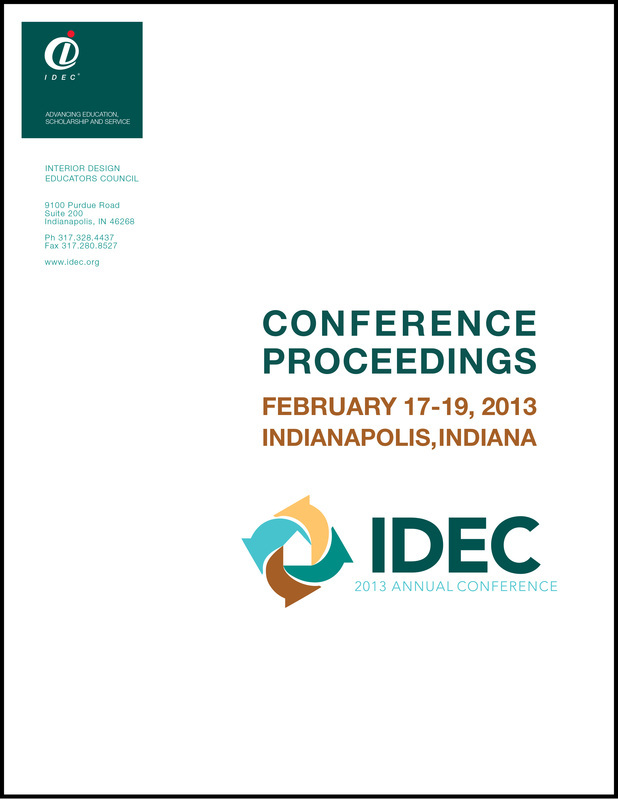 Annual IDEC Conference. Pittsburgh, PA. Mar 2004. Maintaining Order: Vitruvius and Palladio to CAD. Presentation with published abstract. Annual IDEC Conference. Santa Fe, NM. Mar 2002. Crossing Boundaries: Using CAD to Anticipate Behavior. Presentation with published abstract. National American Association of Family and Consumer Sciences (AAFCS) Annual Meeting. Providence, RI. Jun 2001. Programming Space Programming. Presentation with published abstract. 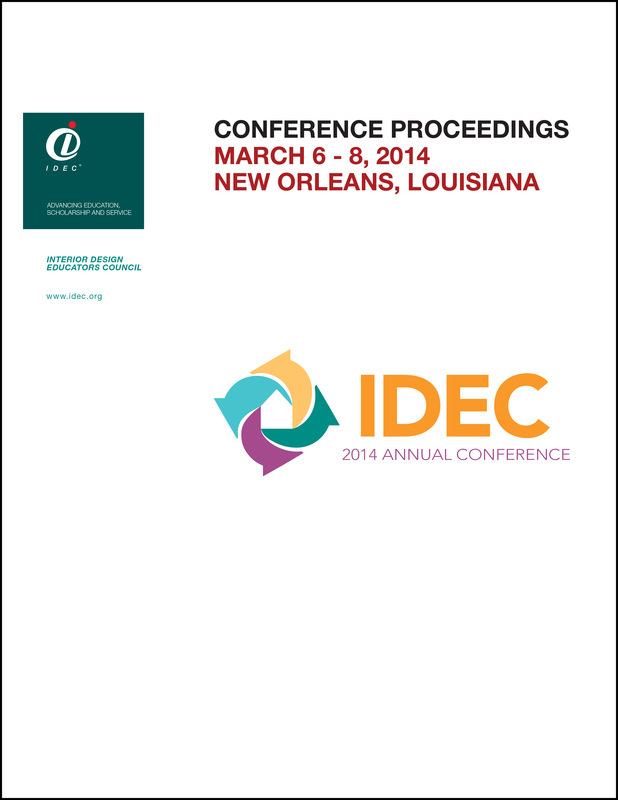 Annual IDEC Conference. Chicago, IL. Mar 2001. People in e-Space: Tools for Anticipating Behavior with CAD. Presentation with published abstract. National IDEC Conference. Chicago, IL. Mar 2001. Facilitating Performance on Studio Projects by Customizing Computer-Aided Design. Presentation with published abstract. National AAFCS Sciences Annual Meeting. Chicago, IL. Jun 2000. Enriching Interior Design Studio Projects Through Multi-Cultural Approaches to Design. Presentation with published abstract. National AAFCS Annual Meeting. Chicago, IL. Jun 2000. ​Checking Codes the New-Fashioned Way. Annual IDEC Conference, Calgary, Alberta, CAN. Apr 2000. Poster presentation. Received "Best Poster Session in Conference" award. Averting Information and Project Overloads: Facilitating Studio Performance by Customizing CAD. Presentation with published abstract. National IDEC Conference. Clearwater, FL. Apr 1999. 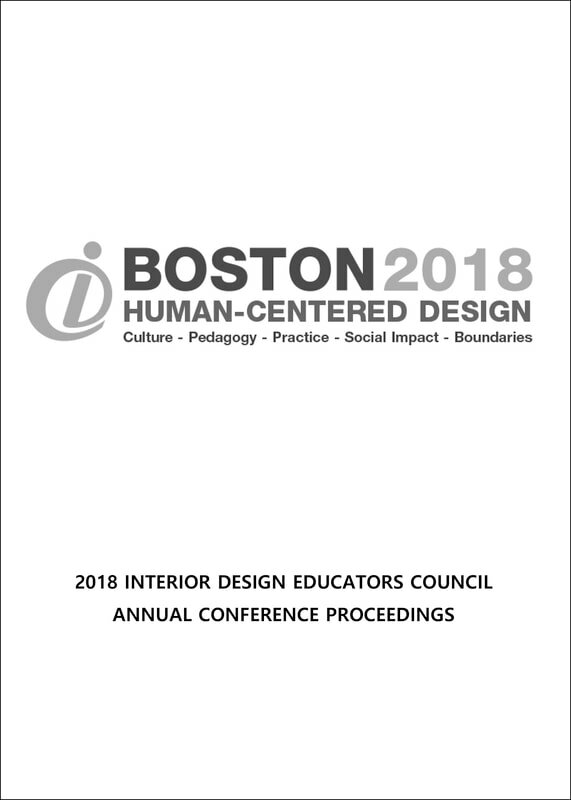 Synthesizing Multi-cultural Aspects of Space Planning and Design Within a Conference Center for the Fashion Industry: An Adaptive Use Project. Presentation with published abstract. National IDEC Conference. New York, NY. Apr 1998. Updating Interior Design Programs for the Millennium: Attracting, Retaining, & Employing Multi-cultural Students. P.B. Miller (moderator), B. Miller, & M. Bateman. National IDEC Conference. New York, NY. Apr 1998. Invited panelist. Universal Design Directives for the Innovative Workplace. R. Null (moderator) with N. Canestaro, T. Houser, M. Inman, and T. Springer. National IDEC Conference. Nashville, TN. Apr 1995. Universal Design Education Project: Beyond Legislation. R. Kilty-Padgett (moderator) with N. Canestaro, B. Flannery, T. Houser, and L. Jones. IDEC Conference. Nashville, TN. Mar 1995. Curriculum Development Research-Synthesizing Lifespan Issues Within the Studio Classroom. N.C. Canestaro & T.L. Houser. Universal Design Symposium. Boston, MA. Nov 1994. Time is not on Our Side—Accountability in Interior Design Education. National IDEC Conference. Coeur d'Alene, ID. Apr 1993. From the Chalkboard to the Screen: Computer-based Space Programming Techniques. National IDEC Conference. Grand Rapids, MI. Apr 1992. Using Spreadsheets to Teach Time Management. T. Houser within workshop: Across Platforms and Software: Computer Applications for Now and the Future. D. Davis and L. Waxman (workshop co-organizers). National IDEC Conference pre-conference workshop. Grand Rapids, MI. Apr 1992.